Bocchit Edmond, Minister of Foreign Affairs participated in the 2nd United States / Caribbean Resilience Ministerial Meeting at South Command Headquarters in Miami organized by the State Department with ministers and officials from 18 Caribbean countries (Antigua and Barbuda, Bahamas, Barbados, Belize, Dominica, Dominican Republic, Guyana, Grenada, Haiti, Jamaica, Saint Kitts and Nevis, Saint Lucia, Saint Vincent and Grenadines, Suriname, Trinidad and Tobago and the Dutch islands of Aruba, Curaçao and Saint Maartin) to strengthen regional response capacities and promote resilience to disasters. 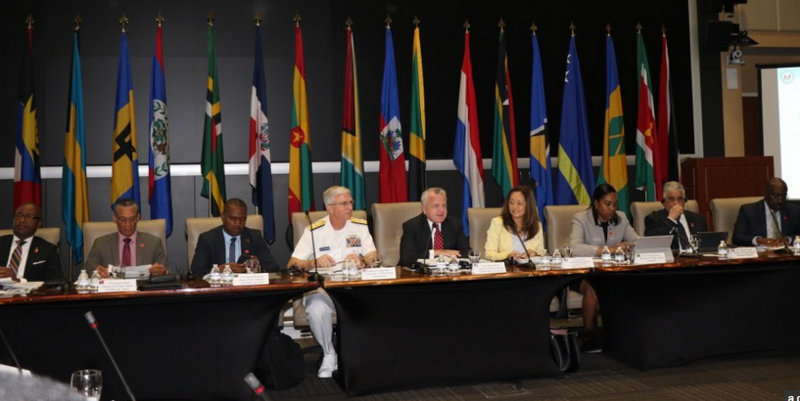 For two days (11 and 12 April), the leaders of the countries of the Caribbean zone and the Americans examined new possibilities of collaboration to strengthen the capacities of preparation and intervention in the region during major natural hazards. Following the meeting, Chancellor Bocchit Edmond said he was satisfied with the discussions that resulted in a declaration of intent aimed at providing logistical assistance to Caribbean nations in the event of natural disasters. He said having explained to US officials the need for the United States to continue working with Haiti, particularly in the training process of the Haitian army. He said they made it clear that it was a non-traditional army that will be dedicated to a series of specific tasks such as border protection and post-disaster assistance. He said he had asked to see how the young Haitian military engineers could participate in training in the Caribbean region, as part of the preparations to cope with natural hazards, of exercises and achievements of great importance for the body of the army of Haiti.